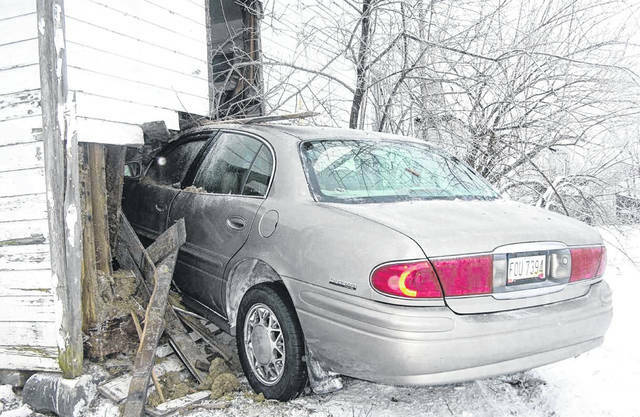 A tan 2001 Buick LeSabre, driven by Jennifer Anne Gibbons, 42, of DeGraff, crashed into an abandoned house at 18135 State Route 706 after losing control on the icy and snowy roadway and going air born. -2:11 p.m.: investigate complaint. Deputies investigated a complaint at Dorothy Love on Cisco Road in Clinton Township that a person claiming to be from the BMV stopped in to talk to someone there. -1 p.m.: property damage crash. Deputies, Houston Rescue and Lockington Fire were dispatched to the 2000 block of Kuther Road in Washington Township on the report a car crashed into a dump truck. -11:03 p.m.: assist other unit. Deputies were dispatched to the Dollar General West Court Street in Clinton Township to assist the Sidney Police Department. -9:53 p.m.: property damage crash. Deputies were dispatched to 4779 State Route 47 in Cynthian Township on the report a vehicle hit a K9. -7:59 p.m.: assist other unit. Deputies were dispatched to Dairy Mart on Michigan Street in Clinton Township to assist another unit. -5:29 p.m.: threats or harassment. Deputies were dispatched to the 5800 block of state Route 29 in Perry Township on the report of a possible CPO violation. -5:26 p.m.: assist other unit. Deputies were dispatched to assist another unit at Broadway Avenue at East Russell Road in Clinton Township. -4:36 p.m.: property damage crash. Deputies were dispatched to Kuther Road at West Michigan Street on the report of a two-vehicle crash. -4:07 p.m.: theft. Deputies were dispatched to 319 Pasco Montra Road in Salem Township on the report of a scam. -3:28 p.m.: investigate complaint. Deputies investigated a scam complaint at 19117 Kentner Road in Dinsmore Township. -3:09 p.m.: property damage crash. Deputies were dispatched to Fair Road at Schenk Road on the report of a two-vehicle crash. No one was cited following a single-vehicle crash on Tuesday at 7:54 a.m.
Jennifer Anne Gibbons, 42, of DeGraff, was traveling westbound on state Route 706 when she lost control of her vehicle on the icy and snow-covered roadway. The vehicle went off the north side of the road and struck a ditch, then went air born and landed on its wheels before traveling through a yard and striking the southeast corner of an abandoned house at 18135 State Route 706. According to the crash report, Gibbons was evaluated by Perry Port Salem Rescue at the scene but refused treatment. Maplewood Fire and Shelby County Deputies also responded to the scene. Wren’s Service Station towed the tan 2001 Buick LeSabre from the scene. -2:49 p.m.: suspicious car. Jackson Center Police were dispatched to the 300 block of East Street in Jackson Township on the report of a suspicious car. -5:09 p.m.: investigate complaint. Botkins Police investigated a scam complaint at 101 E. State Street in Dinsmore Township. -12:37 a.m.: medical. Anna Rescue responded to the 100 block of Birch Street in Jackson Township. -7:55 a.m.: medical. Russia Fire and Versailles Life Squad responded to the 100 block of Borchers Street in Loramie Township. -12:56 a.m.: medical. Deputies, Houston Rescue and Lockington Fire were dispatched to the 10900 block of Commanche Drive in Washington Township. -12:30 a.m.: medical. Anna Rescue and Botkins Police responded to the 100 block of Debra Drive in Dinsmore Township. -4:23 p.m.: medical. Houston Rescue were dispatched to the 3700 block of Beulah Drive in Turtle Creek Township.